One of the long term challenges in the development of humanoid robots is the realization of a dynamic user model capable of supporting natural human-robot interaction. This thesis provides a concept for and an exemplary realization of a perception system which is capable of generating such a model. Thereby the thesis offers major contributions concerning the three central topics of information selection, information extraction and information representation. Based on human communication signals a representative set of relevant information is selected. This information is extracted from auditory and visual sensor information using new sensor data processing techniques tailored to the needs of dynamic interaction scenarios. The extracted information is then formalized into a dynamic user model represented by a combination of basic perceptual information called percepts. 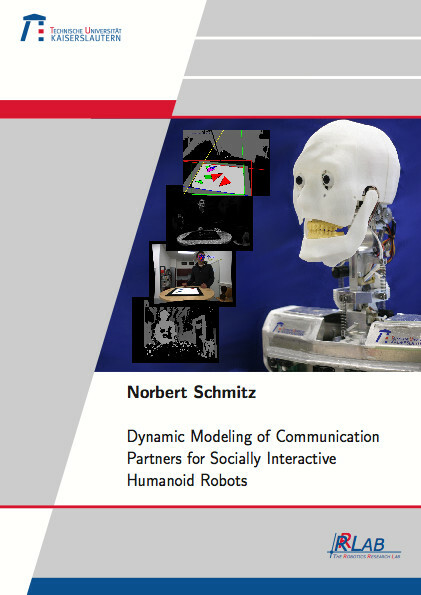 The provided model serves as compact and extensible decision basis for complex control architectures of humanoid robots. Final experiments with the humanoid robot Roman using an interactive game play scenario support the thesis that the proposed perception system is well suitable for the development of naturally interactive humanoid robots.